I will preface this post by stating that my husband is the handiest human being on the planet and I’m forever grateful for all of the things he does to support my ridiculous horse habit! You may recall a couple years ago we built some runs off the stalls on the new barn. All of the runs and a paddock have been completed for over a year, but Boot City had some sort of what I referred to as gate-o-phobia; fear of building a gate. We had a need for at least six gates plus a couple of it-would-be-nice-to-have-a-better-gate-here spots so agreed that we would take some time off work around the 4th of July holiday and do some honey do items around the property. Gates were clearly at the TOP of the list! I don’t know why Boot City had a phobia of building gates, because the finished products are all very lovely and functional gates. If you aren’t a horse person or someone who has an understanding of the need for good gates, this may sound silly to you. Gates are vitally important with livestock. Weak or poorly made gates can break and let animals into spaces where they don’t belong or (much worse) hurt them. 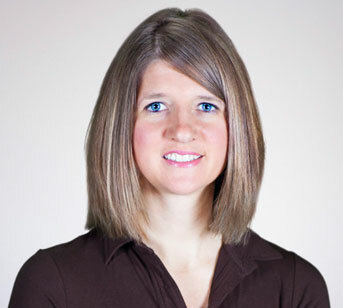 A horse that eats too much of certain types of feed can get life-threateningly sick. If you have multiple species of animals there are some feeds that are fine for one animal and dangerous to another animal. Or animals can get out of their enclosure and onto a busy road. I think you see my point. I wish I had photos of Boot City’s gate designs, but all I have are photos of the actual gates. The first gate goes to the paddock where Sterling is currently convalescing. We had originally planned to put the gate on the other corner of the stall run next to it, but this created an alley that horses would go in and try to kill each other. One horse in the small alley is much safer. This gate has a unique (to me anyhow) hinge that is connected on the actual post. It’s a pretty slick design and results in a very minimalistic look, which is what Boot City was going for when he chose them. You cannot add this kind of hinge later, it has to be planned for when the fence is built because the pipes are welded onto the metal post and the hinge is essentially a ring dropped on said post. It was originally planned to be for the gate to the stall run, but the plan design change affected that, too. Our next long weekend project is to finish the fence that you can see isn’t doing much other than attempting to convince a horse to not step over it. Thankfully most of my horses are lazy and they haven’t busted out yet. Gate #2 is next to Gate #1. Boot City was NOT happy about using this hinge as he thinks they don’t look as good as the one connected directly on the pole, however they do allow for more adjust-ability in how the gate hangs. I think it looks just fine. Sometimes I forget how artsy Boot City is and he cares quite a lot about aesthetics. The bottom of the fences and the gates is about 18″ off the ground, high enough that a horse that lays down and sticks a leg through the fence shouldn’t pin the horse’s leg and cause it to panic. Safety first folks! Both Gates #1 and #2 were built from oil field pipe and sucker rod. Very basic, but nice clean lines. The third gate he built is between us and our neighbor. 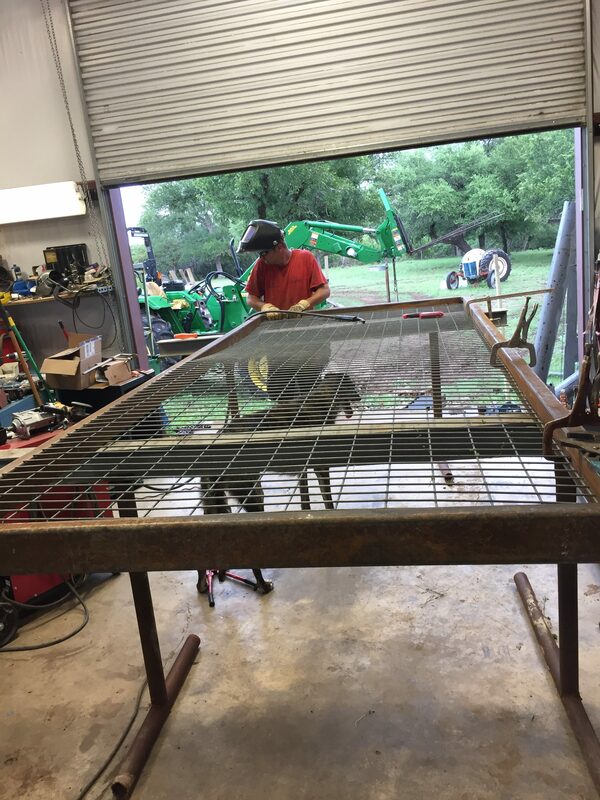 We had long abhorred the gate that was in place and the posts had COMPLETELY rotted out so we decided to just go a head and rebuild a portion of the fence and build a new gate. This gate would be practice for the one that he will build to go at the end of our driveway to keep out the riff raff (and keep IN the damn dogs). 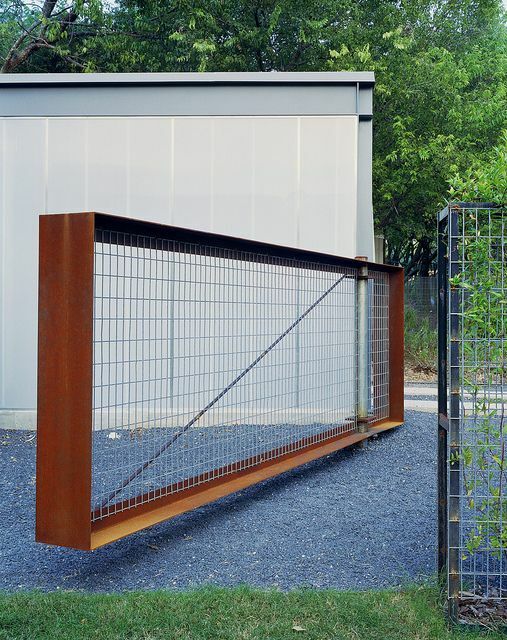 This gate is the inspiration for the design of the gate he will build at the end of the road. We won’t use the exact same type metal frame and unfortunately our driveway entrance isn’t wide enough to do the same type of anchor post with hinge, but you get the idea. I love how it is modern yet fully functional and uses very basic materials. This one was designed by Bercy Chen Studio LP in Austin and the photo is by Mike Osborne. This is the gate in progress. 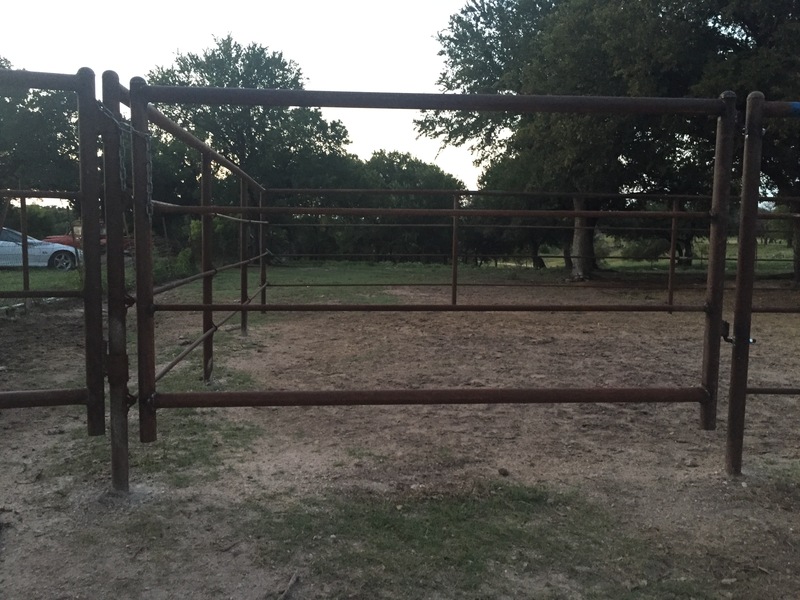 The frame is 4×2 steel tubing and the inside is a 6 gauge horse panel. He trimmed the panel to fit inside the frame and then welded it exactly in the middle of the 4″ tube. This gate will be very sturdy and look lovely! Beerhounds help build gates, dontcha know?! 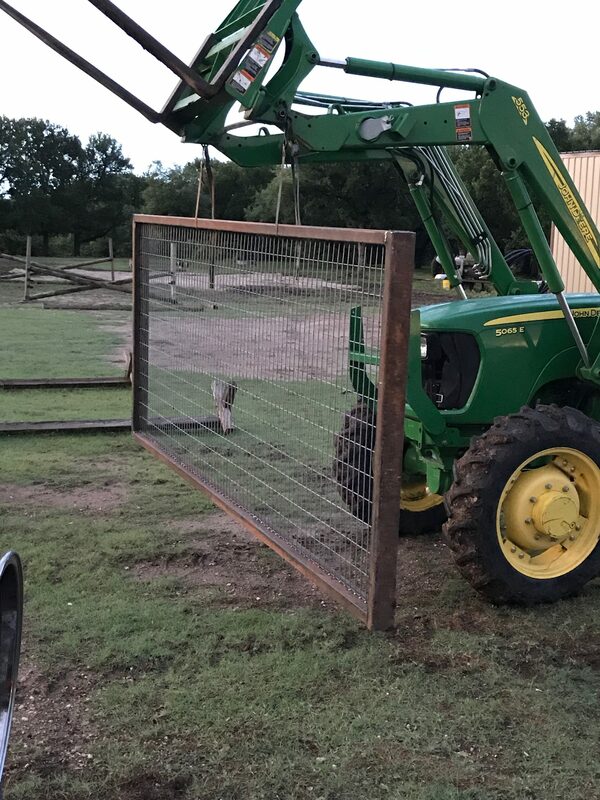 The fence hasn’t been finished so I don’t have a photo of the full setup, but here is the completed gate right before Boot City installed it on the hinge. I definitely felt a sigh of relief that the horribly shoddy gate, that was also about 2 feet longer than it should have been to be stable, is gone. You know what they say about good fences, they make good neighbors. 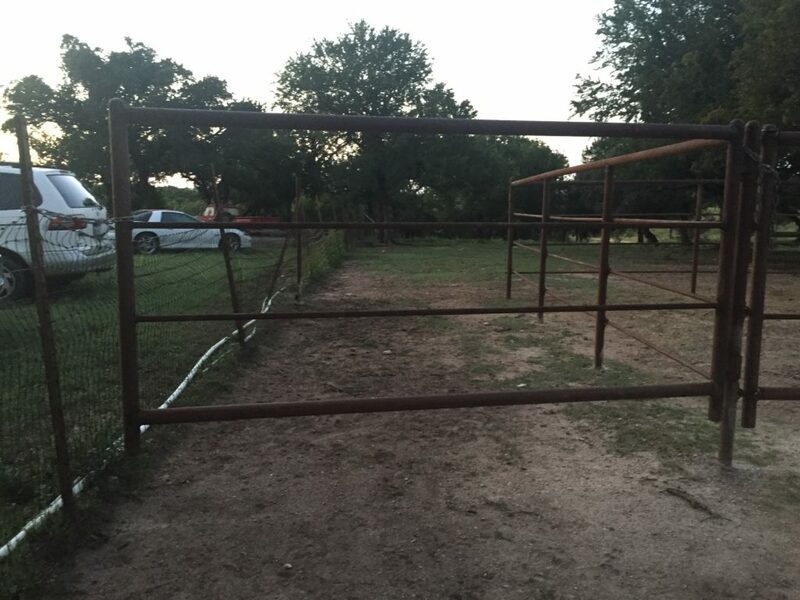 The gate is installed and once this fence project is complete Boot City will embark on building the driveway gate. It will essentially be the same design, but use 6×2 steel tubing rather than 4×2. It’ll also be somewhat longer so may require some type of stabilization in the center area. I’M SO EXCITED TO BE ABLE TO LET ALL THE GOATS, HORSES, AND DOGS RUN FREE AROUND THE HOUSE AGAIN!!!!!!!!!!!!!!!!!!!!!!!!!!!!!!!!!! !